Fresh, raw broccoli is full of nutrition, but it can taste plain or even dry. Steaming it softens the cell structure, unlocking the flavor of broccoli and making it more enjoyable. Still, when you're trying to get as much nutritional benefit as possible from your vegetables, you may worry that cooking them causes losses of important vitamins and minerals. Unfortunately, that is the case. However, when it comes to fresh cuts or steaming your broccoli, steaming might be the smarter choice. You can cook broccoli in many ways, but some are much better than others. Adding butter and salt, for example, adds calories, fat and sodium. Boiling broccoli cooks away some of the vitamins and minerals. Steaming vegetables preserves more nutrients than boiling, and it softens broccoli without adding fat, This helps you get the most nutrition with the lowest possible caloric intake while still producing an attractive flavor. 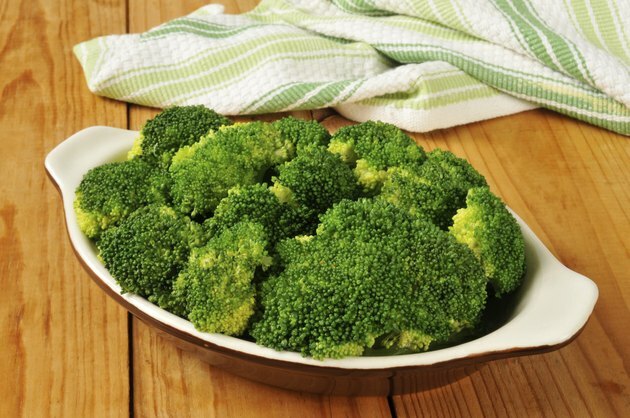 Steaming broccoli does cause a reduction in some vitamins and minerals. Vitamin C is the biggest victim of cooking, with about 25 percent lost in steaming. Folate levels reduce by about 20 percent. Steaming causes a loss of 10 percent of thiamin, vitamin A, carotene and lycopene. All other vitamins and minerals remain nearly intact, with a loss of 5 percent or less. According to a 2009 study at Zhejiang University in China, steaming is overall the best cooking method for broccoli because it caused the lowest cumulative nutrient loss. In 2006, a Polish study revealed surprising findings: Steaming broccoli actually increased levels of health-promoting and antioxidant compounds. Beta-carotene, lutein, and alpha- and gamma-tocopherols all increased when broccoli was steamed. Another study, published in "Nutrition Research" in 2008, found that steaming green vegetables greatly improved their ability to bind to bile acids, which improves their cholesterol-lowering potential. The study's authors recommended regular consumption of steamed vegetables to improve health and nutrition. It may seem logical that eating broccoli in its fresh, raw and natural form is best for health, but research seems to contradict that idea. In fact, steaming broccoli lightly in a small amount of water actually can improve not only its flavor and appeal, but also its benefit to your body. When you're looking for the healthiest choice for green vegetables of any kind, try steaming them until they are tender enough to pierce with a knife, but still crisp and bright green in color. Does Broccoli Lose Its Nutrients if Overcooked?